Aaina Bhargava of Saffronart on Citizen – Artist 2013, the second exhibition in a series of five in celebration of the 50th anniversary of Chemould Prescott Gallery. 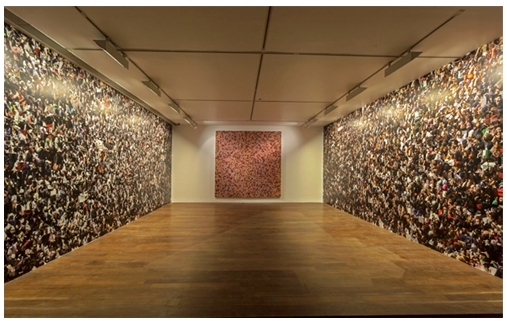 London: September 2013 – April 2014 has and will be an exciting time at Chemould Prescott Gallery, Mumbai. Curating five exhibitions during this time frame, Geeta Kapur depicts an extremely evolved contemporary Indian art scene with Citizen – Artist (Oct.14th – Nov. 15th 2013), mirroring the growth and expansion of Chemould Prescott as a gallery. 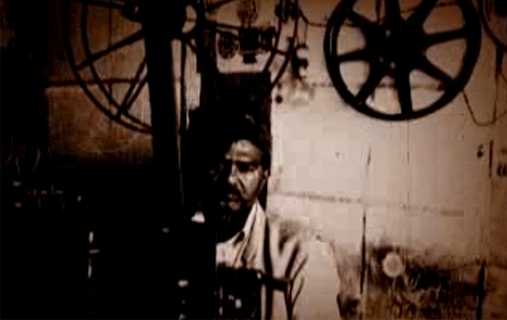 The first exhibition in the series, Subject of Death, was in remembrance of Bhuppen Kakkar, the groundbreaking painter supported by Chemould at the beginning of his career, with this particular exhibition opening on his 10th death anniversary, as well as an ode to the late Kekoo Gandhy, founder of Chemould Prescott in 1963. The second – Citizen Artist deals with notions and definitions of citizenship, nations and borders, the exhibition features works by Inder Salim, K. Madhusudhanan, Tushar Joag, CAMP, Gigi Scaria, Ram Rahman, Shilpa Gupta, Rashid Rana, Atul Dodiya, Jitish Kallat, Raqs Media Collective, Gauri Gill and Arunkumar HG. 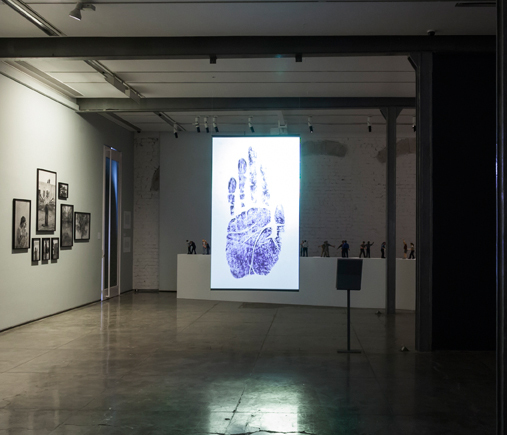 Each work is deeply engaged with the implications of citizenship in a contemporary globalised world. 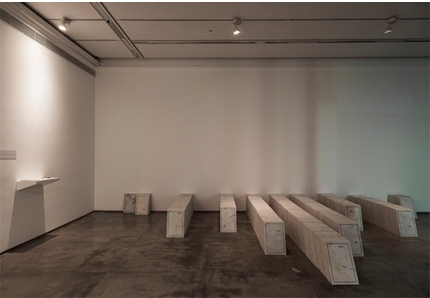 For instance, in Shilpa Gupta’s 1278 unmarked, 28 hours by foot via National Highway No1, East of the Line of Control 2013, she places a graveyard in the middle of the gallery, and creates an index of people who are considered martyrs by their families, but are buried namelessly, questioning the ethics (or lack thereof) of citizenship in Kashmir. 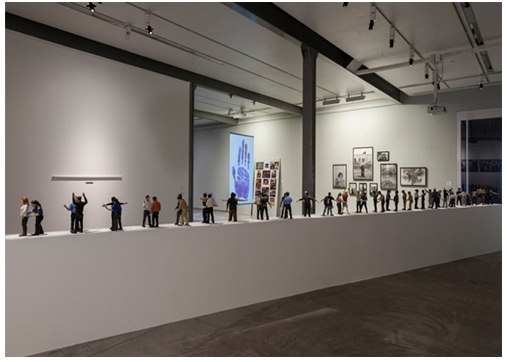 Circadian Rhyme, 2 & 3 (2012-2013), by Jitish Kallat involves miniature crafted-figures staged in a line on a ledge, to depict scenes from everyday travels such as airport security checks, immigration queues etc. In detail, one figure is performing a security ‘pat down’ on another, seemingly commenting on the increase in accessibility of global travel, but the costs and troubles of crossing borders that go with it. The greater accessibility is increasing the crowds, risks, and precautionary measures. Rashid Rana’s Crowd is thematically similar, and is composed of three photo prints on wallpaper involving digitally spliced and manipulated images. An intense reproduction a mixed population people is projected onto the wallpaper focusing on the loss of identity and individuality in very populous. 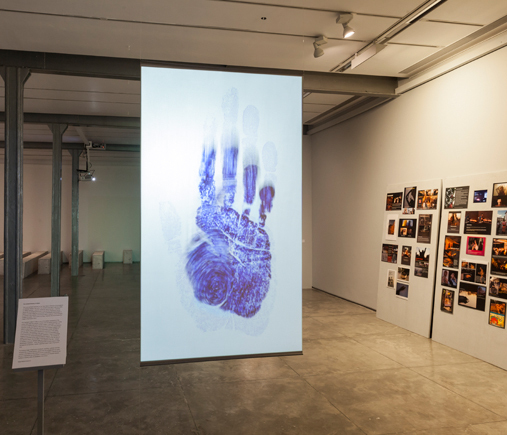 Raqs Media Collective’s animated video projection loop, The Untold Intimacy of Digits (UID) (2011), is an image of the handprint of a 19th century Bengali peasant, Raj Konai, which was taken by British colonial officials in 1858, and then sent to Britain. Fingerprinting technologies were developed from experiments based on this image. The Unique Identification Database (UID – same as the title) is a new project initiated by the Indian government in attempts to properly account for, and index its’ population. This work poses an interesting juxtaposition of India’s colonial past and current day attempts to account for citizens. These are a few amongst many other multi medium and media works that dwell on various aspects of citizenship and certainly don’t seem to be in an aesthetic bind. The third and next installment in the Aesthetic Bind series to look out for is Phantomata (Nov. 29, 2013 – Jan 03, 2014) participating artists include: Tallur L N, Susanta Mandal Sonia Khurana, Nikhil Chopra, Tushar Joag, Pushpamala N, Baiju Parthan, and Pratul Dash. For more information visit about the exhibitions visit Chemould Prescott Gallery website.